I'm very excited to finally show you my next finished quilt! 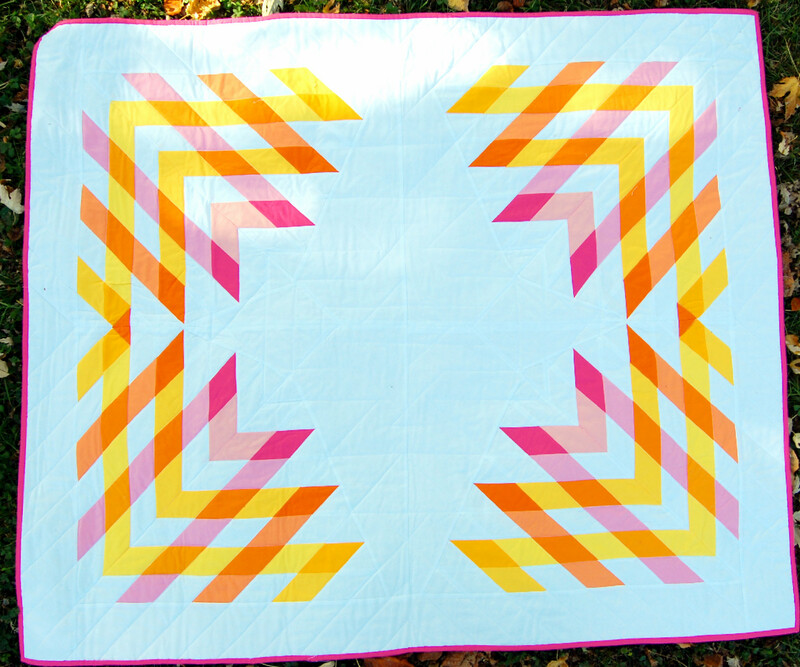 I know you've all seen the top before, but I was saving the finished quilt for this fall's Blogger's Quilt Festival! I've decide to call it Inburst. This is the first quilt that I made in collaboration with someone else. Who might have helped me out with this, you ask? Well, who else but my hubby! That's right. My hubby. He's a graphic designer with a great eye for color and I knew that I'd need another set of eyes to help with this one. I told him what I wanted to do and what kind of colors I wanted to make it and he was able to lay it all out on the computer for me. We spent a lot of time looking through the Kona Color Card trying to find the perfect colors. I think we did pretty good! 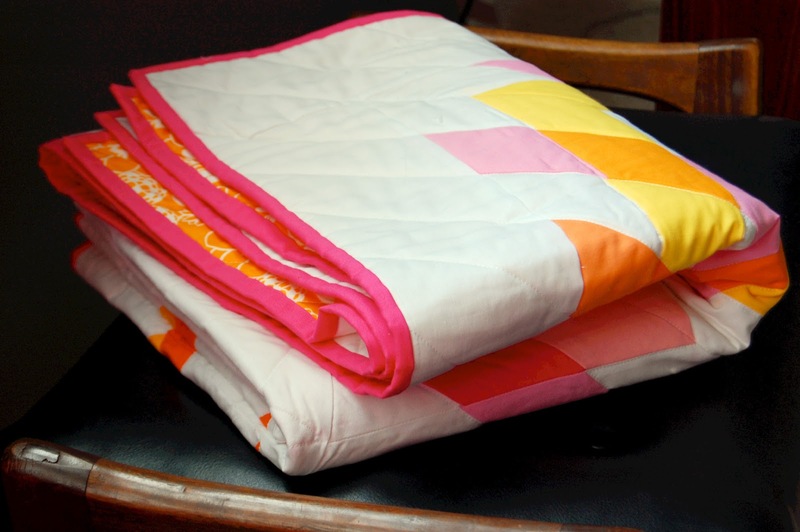 We finally narrowed it down to 11 different Kona solids for this quilt to achieve the look I was going for. I really wanted it to look like the colors were transparent and overlapping. I think the photo below shows the look the best, even if it is a little bright! (I could use some photography tips!) That's a really difficult task! I used Kona White, Canary, Corn, Azalea, Carnation, Primrose, Mango, Kumquat, Orange, Papaya, and School Bus. The Binding is Kona Azalea and the back is Dear Stella Bukhara in Orange. I quilted it just outside of the ditch and took each row to the edge of the quilt. I echoed in to the center and really just had to improvise as I went. I had trouble taking a photo that shows the center quilting. The photo below show how the center quilting turned out. I'm really pleased with how it turned out! I have no idea what I'm going to do with this one. It doesn't match my house. I'm trying to talk my daughter into letting me redo her bedroom so I can hang it in there. She doesn't like change. So This one's just going to sit for now. That's kind of sad, don't you think? 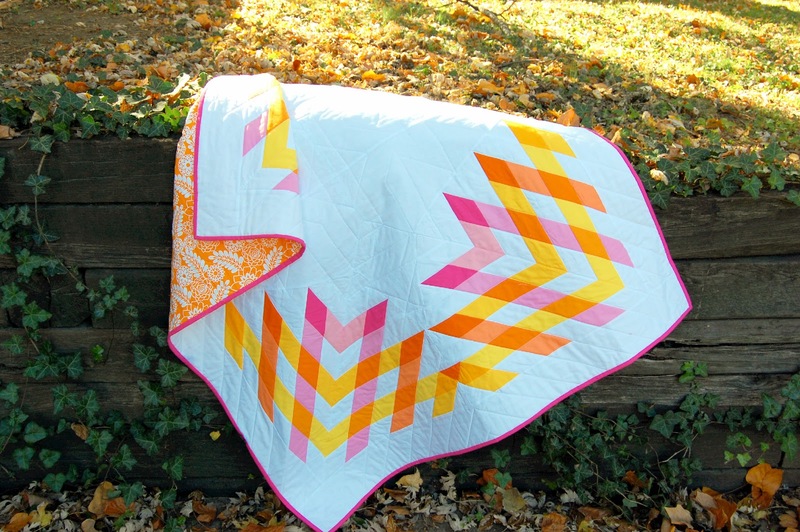 Happy Blogger's Quilt Festival! I'm just loving looking at all the wonderful quilts. Inspiration has hit and so I'm off to start a new something! Wow!! I love it!! Nice work, Kyndra. Great job to you both, you certainly have the overlapping, transparent look. I think you two should collaborate more often if this is the result! 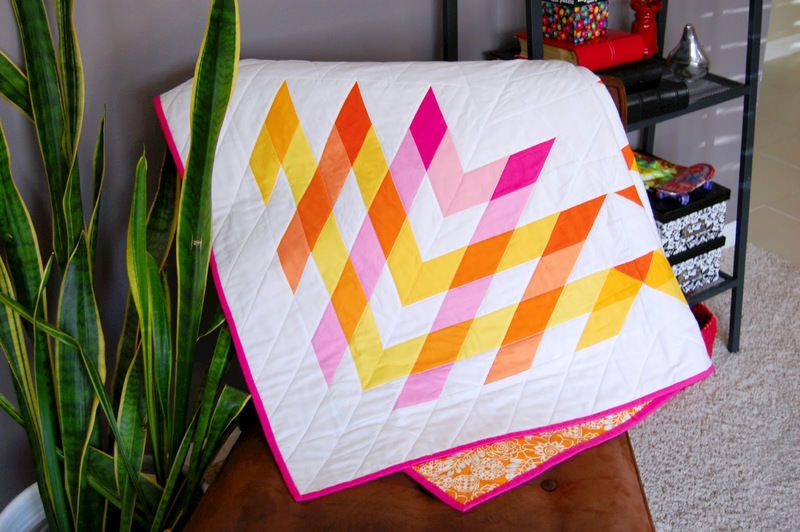 Great quilt - love the fresh colours and clean lines. How romantic! :) Your hubby sounds like a great guy. Beautiful quilt! If you don't know what to do with it, should I send my address? :) Popped over from the quilt festival for a visit. Great job!! Ha! Thank you so much! I'll have to keep you in mind if I can't find a home for it! lol :) Thanks for stopping by! I like it. I would be happy to adopt this one! the colors on this are perfect! You (and your husband) did a great job on the design. I love it! Thanks so much! I really enjoyed making it! Kyndra! This is gorgeous! It definitely has that graphic feel to it - like prints when the colours are intentionally staggered a bit… I love it! Really beautiful! Thanks for sharing your process! This is beautiful! Great job!! It's a winner!! Love the pattern and the colors! Well done, great work! amazing use of color to acheive transparency!! Thanks! It was kind of nerve wrecking to make it and yet wonder if the finished product would look like the plan! Love this one Kyndra! 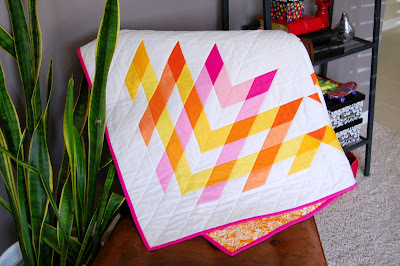 The quilting, the colors and definitely the pattern are all stunning! Great design and love the color palette you chose. Very nice!! The graphic design is amazing and the color choice is superb. Great combination of talents in a wonderful quilt. Beautiful quilt, you did a fantastic job on choosing the colors and getting them in the right spots. I love the quilting too. Thanks for sharing. This is one of my favorites from the festival for sure. Nice placement. I don't think I could love the transparent look of the colors more! I dream of making quilts like this! Seriously - I took a color theory class in college and ever since I have been dreaming of the day I can replicate the transparent look this well (especially without dyeing my own fabric!). Congrats! !